Rorrison's Sinners bring a touch of the Masonic to the playing card world. From start to finish it took us over a year to get this deck to the finished result, the deck is full of Masonic symbolism and imagery, which culminates in a truly stunning deck. The deck strays away from conventional playing card design with a unique colours and back design. The tuck box is a soft matte finish and sports black embossed lettering giving the feeling of real luxury. 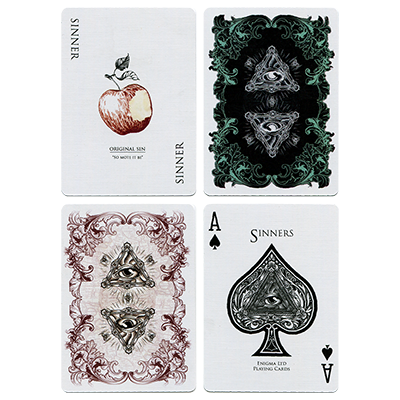 Sinners were printed by The United States Playing Card Company (USPCC) in Erlanger, Kentucky as they consistently deliver well made and quality decks. Rorrison's Sinners Deck Rorrison's Sinners bring a touch of the Masonic to the playing card world.